If you were born with doll-like lashes, kudos. Having to curl eyelashes every day is not only a nuisance, but sometimes it doesn't even last. As someone with stick-straight lashes, my eyelash curler is simultaneously my best friend and my worst enemy. I rely on it daily to help my eyes appear bigger and brighter. But the curl it provides never lasts as long as I want. The struggle to have endlessly curled lashes is real. However, there is a way to curl lashes to make sure the curl holds longer. Although it is much faster to just pinch the lashes in one place at the base, when the lashes start to fall, they will return to straight much more quickly this way. Instead, pulse the curler throughout the length of the lashes. By curling at three points instead of just one (base, middle, and top), lashes will appear to have a more natural curl. And besides this, if only one section falls, the lashes will still appear to have some curl to them. One of the simplest things you can do to make sure your eyelashes stay curled all day long is to apply a waterproof mascara before your regular mascara. A waterproof formula can seal the curl to ensure your lashes won't droop throughout the day (think of it like hairspray for your lashes). Of course you can stop at the waterproof, but you can also layer your favorite mascara on top for longer and thicker lashes. We've been told time and time again to always curl eyelashes before applying mascara. This is because, if you curl your lashes after applying mascara, the mascara can stick to the curler and cause your lashes to either break or be pulled out (ouch). But, if you're very, very careful, curling your lashes after applying mascara instead of before can actually help your curl hold. Just be sure to wait long enough after applying mascara so that it is completely dry before you take a curler to your lashes. You'll also want to proceed more slowly than you normally would. 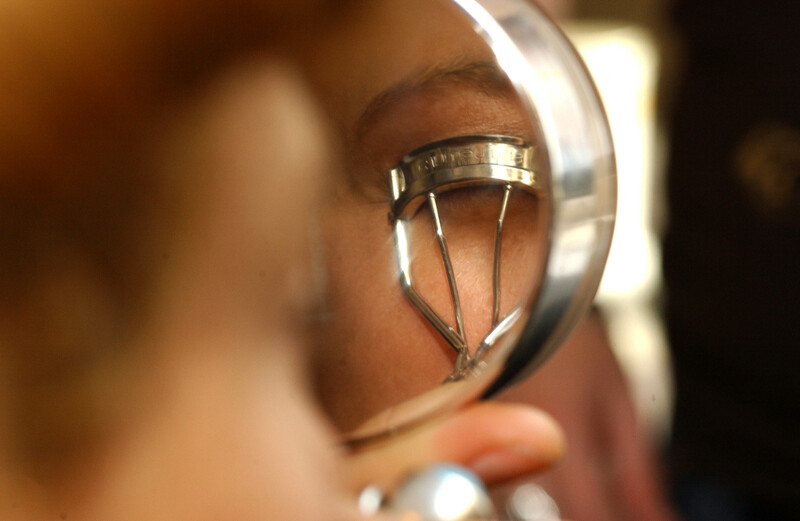 Use gentle pulses and never squeeze too hard, and your lashes should stay curled and in tact. Although heating an eyelash curler with a hairdryer has been touted as a hack to prolong a curl, this method can actually be quite dangerous. Of course, if you proceed with extreme caution, it can work, but the potential harm and damage is not worth it. Because the skin around the eye is so much thinner and more sensitive than other areas, it is surprisingly easy to burn using this method. And even if you think your skin can handle it, do you know if your eyelashes can? While thicker, darker lashes can tolerate a little more heat than finer, lighter lashes, it can be difficult to know just how much heat is being applied to the lashes. And too much can actually cause lashes to break off with the curler when it is squeezed. There's really not much worse that can happen when curling lashes than releasing the curler and finding that all of your lashes have burned off. So please put down the dryer and use a waterproof mascara instead.